Village Members receive registration priority. Payment confirms your registration and is due in advance. Let the Village office know if you need a ride! As the Village grows, from time to time events with limited attendance are fully subscribed with a waiting list. If you wish to participate in any event, please sign up early. You can do so by calling the office at 773.248.8700 or e-mailing celebrate@lincolnparkvillage.org. Lincoln Park Village welcomes any comments, suggestions, or concerns that our members have. Please click here to fill out our form to give the Village office your feedback. Thank you! Learn practical strategies to reduce the fear of falling by reducing risk factors & increase activity levels for better strength and balance. Join us before store hours to take a dive into the world of the iPhone while enjoying a quiet atmosphere. Village members will learn from the helpful Apple experts on how to use iCal (calendar app), Notes and Reminders that can be used on both iPhones and iPads. Find out how to enter a calendar event on your iPad and see how it shows up on your iPhone (and vice versa!). Film screening followed by a discussion led by Michael Grover, MD from the Institute for Psychoanalysis. Members of a world-renowned string quartet struggle to stay together in the face of death, competing egos and insuppressible lust. Members John Buenz and Jack Hartray and the Windy City Jammers, a merry band of musicians, play great, classic hits, for an evening of good cheer. Self-hosted dinner. Join us to meet and hear the story of Paul Giannone, who followed his passion to a new career. Enjoy the wood-fired pizzas that put Greenpoint in Brooklyn on every culinary map. Eat, drink and mingle at Paulie Gee's in hot Logan Square! Are you a Veteran of the United States armed forces? If the answer is yes, you could be eligible for a range of benefits and services provided by the U.S. Department of Veteran Affairs. Join us for a conversation with experts, Andrea Pottebaum of the VA Regional Office and Shanita Arrington of Jesse Brown VA Medical Center, to learn about benefits you may qualify for and how to access your benefits. There will be a Q&A following the presentation. The evidence-based fitness program developed by the Women's Health Foundation (WHF) which focuses on improved control, confidence and understanding of the pelvic floor. Enjoy great food and intellectual fare with fellow Village members. Seth Magle will share research from the Lincoln Park Zoo's Urban Wildlife Institute, a scientific institute committed to helping humans and wildlife coexist in cities. Learn more about the biodiversity in your own backyard-coyotes, foxes, night herons-and ways you can be involved. Please let the Village office know what you plan to bring-salad, main course, side or dessert-and bring a beverage to share. Donations for the Lakeview Pantry will be accepted. We ask that you bring the most needed items: canned soup (including low sodium), meat ravioli sauce, shelf stable juice, coffee and shampoo. Kartemquin-produced films include the award-winning Hoop Dreams and The Interrupters. This program will feature Now We Live on Clifton, a 1974 documentary about gentrification in Lincoln Park. Miles Harvey, of DePaul, will facilitate a conversation with Peter Kuttner, a Kartemquin Producer, and Roxy Roth, who appears in the film. Admissions is free but interested attendees must RSVP by visiting the event site at http://tinyurl.com/lpcri or by emailing: cgr@depaul.edu. The Lincoln Park Community Research Initiative was founded during the DePaul Centennial (1998-1999). It is a partnership of Lincoln Park community organizations, businesses and DePaul University with a goal to collect, document and preserve the shared history of DePaul University and the Lincoln Park community. The educational programs, which are held in the spring and fall, examine the diverse cultural and political issues of the community and city at large. Join Village sponsor Hearing Health Center to learn about the latest findings on hearing health and the impact of hearing loss, the relation of hearing to your health and well-being. Call the Village office to schedule your screenings. Join members and guests for a continuation of the "LGBTQ Cinema" series. Audrey Hepburn and Shirley MacLaine portray two teachers who are the victims of gossip regarding their supposed lesbian relationship. Based on a 1930's play by Lillian Hellman. Click here to for movie notes from Ira Kohlman. Both novice and skilled players are welcome to this fun and friendly word game. Members & guests - $49 for a four course meal (not including tax, tip, and cost of beverages) or a la carte. Use your VIP Membership card for a 20% discount. Join Village member Barbara Susin for a wonderful self-hosted Thanksgiving meal at Drew's on Halsted restaurant. Reservation deadline November 17th. Call the Village office to reserve your spot. Join this group, hosted by Ellen Stone Belic, to learn and practice basic meditation techniques. This is a great opportunity to start or renew your practice - and to experience the joy and multitude of benefits of meditation. The next session will be on Saturday, November 12. Arrive at 9:45 AM for setup, meditation is from 10:00 - 11:00 AM. If you would like to attend or receive notices of upcoming sessions, e-mail Ellen at ellen@stonebelic.com. This group meets Mondays from 10:00 AM to 1:00 PM in members' homes, usually with three tables. The next meeting will be hosted by Lois and Steve Stack on Monday, November 14th. If you are interested in joining, please contact Laura McCormick at lcormi@gmail.com. Our vibrant restaurant group takes advantage of all our great food city has to offer. From BYOB to BBQ, French to fusion, seafood to steak--we try them all. If you want to receive information about these outings, please contact Helene Stoffey at hlnstvns@gmail.com. Member Brigitte Erbe has started a stammtisch, which is the German word for a "regulars table" and describes a friendly get-together on the second Tuesday of every month at 5:30 PM at Basil Leaf Cafe, 2465 N Clark Street. The next group session will be Tuesday, December 13. The group will meet for dinner and a roundtable discussion of a group-selected topic of interest. Brigitte will send out a notice at the end of each month to those who have signed up. Each roundtable will be limited to 8 participants, first come first served. She is hoping to have a list of about 20 interested people as not everyone will be able to come every month. If you would like to attend the next session and/or become a member, please contact Brigitte at berbe@comcast.net. The knitting and crocheting group meets most Wednesdays from 3:00 - 5:00 PM at Sister Arts Studio (721 W. Wrightwood). Beginners and experts are welcome to join. The group will be making hats, scarves and mittens for the Night Ministry. Bring your needles and yarn, maybe even some coffee or tea. Sister Arts Studio will be happy to supply needles and/or yarn, patterns, and tips.For more information, please contact Beth Hickey at bethhickey37@hotmail.com. For the second Saturday of each month, Kathy Sauer and Mel Washburn will recommend a film currently showing at the Landmark Century Theater at 2828 N. Clark Street just north of Diversey. After watching the film, members are invited to join Kathy and Mel in the Landmark Century's bar for a self­hosted beverage and a lively discussion of the film. The next date for the film screening will Saturday, December 10. Check back on this Pastime section for the name and time of the film. If you would like to be added to the email list for this group, please email Mel Washburn at melville.washburn@outlook.com. On average, 36% of one's income goes towards housing and health care at age 75+. Are you prepared? This program offers valuable insight on current housing options in retirement, their associated costs and how to evaluate what will work best for you. Join us for this session, in collaboration with Raymond James and Legg Mason, to learn more and receive their full booklet with worksheets, tools and resources to help you plan for your future. Participants can also sign up for complimentary, one-on-one planning sessions in the weeks to follow. Ridershare applications for smart phones are becoming increasingly popular and convenient ways for people to get around Chicago. Participants will receive assistance downloading the apps onto their smartphones and be given a tutorial on how to use them. Together with Chicago Innovation Awards and The Retirement Research Foundation we are hosting the 1st annual celebration of "ageless innovators," people over 60 years old who are "reinventing" vs. "retiring," continuing to take risks, and launching new ventures. The event includes a reception with food and drink provided by Blue Plate and a panel discussion led by Tom Kuczmarski. Share your favorite memories or memoirs by the moonlight. Refreshments and snacks served. Take a docent-led tour of the James and Emilia Govan collection of crèches from around the world. See how artists in other countries adapt the cr èche based on materials available, the local climate and their vision of the Nativity. Todd Haynes' retelling of a 1950s Douglas Sirk melodrama, All That Heaven Allows. This film addresses issues that should have been addressed then. Julianne Moore is a proper suburban housewife married to a closeted gay businessman played by Dennis Quaid, and she is romantically interested in her black gardener. Both novice and skilled players are welcome to join in on this fun and friendly game. Tables are set up by experience. Beverages are provided, but guests are asked to bring a snack to share. Dinner included with self-hosted drinks. Celebrate the eve before New Year's Eve with a family-style Greek dinner and show by acclaimed jazz performers Anne Burnell (the Village's beloved first NIA teacher) and Mark Burnell and their band, along with other guest performers. for a list of prices and packages. Join in anytime! For more information about NIA, click here. Check out these special offers for Village members to stay active. Contact the Village office for information on obtaining a one-month free trial membership. Contact the Village office for information on obtaining a 7-day trial membership. The Village uses an asset-based approach to identifying first-rate resources for members, leveraging existing strengths within our communities. This approach has led to the formation of strategic partnerships with two organizations chosen for the breadth and depth of their capabilities and their recognized expertise in the health and well-being of older adults. Membership is available to people 50+ living in Chicago's north side communities from River East to Edgewater and beyond. For your convenience, you can click on the membership application below, or if you prefer, call the Village office for other options. A reduced-rate program, Member Plus, is available for those on limited fixed incomes. After becoming a member, we will welcome you and connect you to the specific people, activities and services that fit your unique interests and needs. Our goal is always to help you explore possibilities and support your choices so you can live the life you wish to live. What is Lincoln Park Village? Lincoln Park Village is a leader in the nationwide Village movement. It is an innovative, nonprofit membership organization, shaped by its members to create possibilities and choices for our lives. As a volunteer-based community, we provide stimulating, challenging activities and programs, help if it is needed, a sense of belonging, and opportunities to contribute and build for the future. Our Member-Plus program enables all neighbors regardless of income, to join and integrate fully into Village life. By leveraging the talents, wisdom and skills of older adults, we have become an important asset to our communities and to each other. Together, we are helping invent a different future for older adults in America. Serving Chicago's North Side neighborhoods from River East to Edgewater and beyond, our Village is a unique resource--professional yet neighborly and close-by--valuable to you right now and as your needs change. Last night the Village's Near North Circle members gathered for an election watch party--what a night-- and I was struck by the immediate fellowship among new and long-time members and how our members are "there" in support of one other. The web of trust and connection is strong. Whether problem solving, celebrating or grieving, no one has to do it alone. We are interdependent. We are each other's allies. An example of alliance is the focus of this newsletter: how adult children and other friends and family can become allies to older adults as their needs change. This is a subject of such importance that an Adult Children's Task Force has been created, spearheaded by Sarah Squires Doyle whose experience with her mother led her to take action. (See her story below). The Village stands as ally to its members and their families and friends. There are myriad ways the Village can help - from volunteer drivers to help finding in-home care, to assistance with paying bills and home maintenance, to deciphering the benefits of a long term care policy, to "boots on the ground" for out-of-town family members. Work such as this is made possible by the generosity of individuals, households, the business community and foundations who support the Village. With thanks and gratitude, our Honor Roll recognizes each gift from Village donors and sponsors. This support is vital as membership fees cover less than 40% of our budget and gifts also enable us to provide confidential financial assistance to 22% of our member households so that all who wish to, regardless of income, can join the Village. Because of the engagement of so many, the unique social invention that is our Village-and the village movement-- will continue to thrive within our many neighborhoods and throughout all our futures. The Village welcomes these new and renewing members. Thank you all! Click here to view new and renewing members. Kathie Kolodgy (3rd from left) with her family. Kathie Kolodgy has agreed to serve as the next president of the Village Board - a role she was eager to take on, in part because the Village has been such an important resource for her and for her family since they moved to Chicago about 6 years ago. "We had moved here from Toledo. My folks were still living independently, but they knew they could not go on much longer. My dad was struggling with dementia and other physical ailments and they agreed to join us in Chicago and we became Village members." Kathie describes how pleased they were to find a place with an entrance at street level, so that her dad would not have to climb stairs. She and her husband Bob occupied the upper floors and the family often shared meals together. "My mom gave up a lot by moving here. She had a rich social life back in Ohio. But the Village helped her make connections with a group of women and through the Village, she was able to access transportation for the endless doctor appointments. And toward the end of her father's life, the Village provided good counsel on hospice care." Almost a year after my dad's death, my mom went back for the first time to Toledo and had a wonderful visit with old friends." In Kathie's words, her mom is blossoming. "People say to me what a great sacrifice you are making, but I don't see it that way. It really did ease my mind to have them nearby." When asked what she would do differently she observed that she did not dwell on regrets, but that she would not "worry so much." As Village President, Kathie wants to keep attention on intergenerational issues, including ways to build alliances between adult children and their aging parents. Claire Berman is a writer based in New York. She is the author of "Caring for Yourself While Caring for Your Aging Parents". Her article appeared in the Atlantic. A number of years ago author Claire Berman wrote a book aimed at helping adult children of her generation manage the many challenges of caring for aging parents. Now that she is an aging parent herself, she realizes that in writing the book she talked to all possible resource: geriatricians, elder law attorneys, social workers, and more - everyone except aging parents. She now recognizes that "As parents get older, attempts to hold on to our independence can be at odds with even the most well-intentioned "suggestions" from our children. We want to be cared about , but fear being cared for. Hence the push and pull when a well-meaning offspring steps onto our turf." The issue revolves around the fact that "There's a fine line between caring and controlling-but older adults and their grown children often disagree on where it is." A friend of the author has mixed feelings about her daughter's visits: "Whenever Brenda drops by, I'm not sure whether she's come to visit or to check up on me: Does my home meet the clean test? Is the yogurt in my refrigerator long past its 'use by' date? I feel like I'm constantly being assessed," she concluded. Read about some other experiences of parents and how to negotiate that fine line between caring and controlling here. Stacey Gordon, LMSW, has over 20 of years experience in aging related services and is the Founder of ElderOptions, NY/Chicago. She is also is an adjunct professor at the University of Chicago School of Social Service Administration, where she teaches M.A. students in the Older Adults program. Here she writes specifically to her generation, Gen X'ers - but her insights work for adult children of any age. It was her profound insight about becoming allies that stands out as the key to navigating intergenerational relationships. You can read her complete article here. Rather than trying to parent your parents, become their ally. Have a talk with your parents about illnesses that cause dementia. Ask them what they would like should they develop a cognitive impairment. Gordon's final word of advice for Gen X-ers is this: "It's time to show our resourcefulness, our flexibility and our resilience to stand with our parents as they and we figure out how to proceed from a point of strength and dignity." The survey results: Nearly two in five families disagree on the roles children should play as parents age. For example, more than 90% of parents think one of their children will become executor of their estate, 27% of their kids don't know that they're expected to take on the role. For another example, three-fourths of parents assumed one of their kids would take over long-term care responsibilities, but that was news to 40% of the adult children who were tapped for the role. The primary reason children have no clue that their parents expect help with any of of these tasks: Parents haven't ever told them. Almost half of parents said they have not had detailed discussions with family members about long-term care and eldercare - and an additional 23% of parents have never talked about the subject with their kids. The message is clear - have that conversation - both parents and their adult children need it, want it. Here are two books that can help. 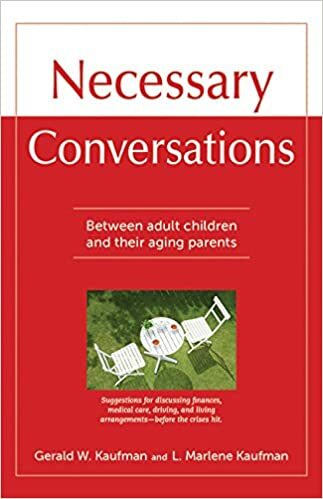 Necessary Conversations is filled with stories and examples from many families, most with different life circumstances, but all facing these same issues. The chapters end with "Getting Started," a list of suggestions for action, as well as "Questions" for focusing on practical outcomes to the discussions. The book includes a series of exhibits-from a "Needs Assessment for Caregivers" to a "Medications and Supplements List" to a "Driving Contract and Checklist." Gerald W. Kaufman and L. Marlene Kaufman have been family counselors for nearly 40 years. "I can count on Annie," says Myrna Knepler of her youngest daughter. Annie, a university professor who lives in Portland, Oregon, visits Chicago fairly frequently and maintains a close relationship with her mother. "Mom can articulate her needs and is able to talk about issues such as end-of-life care, which makes for good communication," says Annie. "I learned when my father died that it's important to know what a parent wants and that details must be spelled out clearly." "Mom is a self-starter," Annie observes. And indeed Myrna is, taking classes run by O.L.L.I. (Osher Lifelong Learning Institute) such as the History of Chicago, practicing yoga, participating in a chorus, and enjoying movies and dinners with the Village Lake View Circle. That was Myrna cheering for the Cubs from Sheridan Road during their victory parade. "Because I live so far away, I am grateful that Mom has the support of Lincoln Park Village. Recently, when she had a health issue, a person came to her apartment to check on things and do light work. I know that I can contact the Village if my Mom needs something, and they will always welcome my phone calls." The Village memoir group is one more way Myrna connects with others. "You feel a sense of closeness with people whose lives you hear about," she observes. "We all share common interests and have fun together." Recently, Myrna and her daughters were reunited at the wedding of her granddaughter. "There's a special sense of intimacy you share with your children," says Myrna, who will, no doubt, capture this family reunion in her memoirs. Don with his mother, Marilyn. Each caregiving story is unique but few of them extend 30 years; yet that is the length of time Don Bell spent caring for members of his family. Don, a Village board member, took a leave of absence from an administrative position at the University of Illinois at Urbana/Champaign in the early 80's when his mother, Marilyn, developed cancer. As she recovered, his father began to experience a cascade of health problems related to diabetes. It was during this period that the children of a cousin (two boys, aged 2 and 3) were put into foster care. Don would not accept this and made arrangement to adopt the boys, himself. Don's career plans had to be sacrificed as he managed the household, though he held significant positions at several Chicago area academic institutions during his long years of caregiving responsibility. Ultimately, he and his mother cared for his father for 12 years, and, after his death, Don took care of Marilyn (this involved two additional cancers as well as an amputation) for another 18 year until her death 3 years ago. His sons, now married, are doing well and Don is the grandfather of six. Lessons learned? It is abundantly clear that nothing prepares you for the sacrifices: the financial drain, the loss of house and savings, and the limits on personal time that caregiving can require. However, Don considers himself fortunate. His parents were a devoted and loving couple, they were completely open and forthcoming about the myriad issues the family faced, and they were confident in his love and support. "I was particularly fortunate that both of them maintained their mental faculties until the end." As for those 30+ years: "I am grateful... I wouldn't trade any of it." Emily Spoerri's mother, Mary Moore, is 98 and Emily has been overseer of her care for the past sixteen years. Emily is quick to acknowledge that she has several advantages which make her story uncharacteristic. Mary Moore married several times. Her last marriage was a very happy one and it was only after Mary's husband's death, when she was 82, that Emily became more directly responsible. Though the Spoerris' wanted to move her to the Chicago area, Mary preferred remaining in her Indianapolis home and her financial security made that feasible. Emily's only sibling, a sister, lives farther away so the primary oversight of Mary's care was a responsibility that Emily undertook with characteristic good grace and dedication. Through an Indianapolis agency, they were fortunate to employ two excellent caregivers. Emily drives to Indianapolis every 2 to 3 weeks and stay for 3 days. During those visits, she enjoys time with her mother and the two caregivers, as well as supervising the household details. Emily's role has been greatly aided by the understanding and complete support of her husband (Emily's unquestioned ally). Another plus is the sunny, optimistic personality of her mother. Now, the hardest part is emotional. Mary was so vibrant and had a wonderful life but seeing her bedridden, watching the deterioration, the loss of memory and the fear which sometimes accompanies that, brings its own grieving. What lessons has Emily learned? It is important to speak of death and the future. Her mother never wanted to talk about it and it's now too late to know what she really wants. Be content with the pace. "God has His own timetable". And, really important: "If you hire caregivers, take the time and effort to hire good people!" Sarah Squires: Who Should We Turn To? Sarah recalls how it all began. "Our family was thrown into crisis when my mother Susan Squires, Village member and volunteer, collapsed at home and experienced multiple catastrophic health events for more than a year. She ended up in a vicious cycle of surgeries, complications, re-hospitalizations, infections and amputations to her lower extremities. She stayed in multiple rehabilitative care settings and was bounced back to the hospital with complications more than ten times. At one point, we brought her home with 24 hour care and were stunned to learn that we had to pay $15,000 per month out of pocket because Medicare didn't cover home care. We wished we had been more informed and better prepared. Throughout her downward spiral, no one addressed the "big picture" until the bitter end, just two days before she passed away. Although we knew she had advance directives in place, we didn't talk about them. When the time came to make critical decisions, it was too late to ask what she would want and we were faced with gray areas that made the situation stressful and difficult. When we decided to stop the madness and move her to hospice, she died just 24 hours later. We wished we had known more about hospice and elected it sooner. Lessons learned? Sarah wishes that the family had started the conversation about aging transitions and end of life wishes before the crisis occurred. Her family's experience led them to share their story with Life Matters Media which has created a video about their experience which you can see here. We posed the question, "How can adult children and their parents be allies?" to two experienced social workers. They are Kate Krajci, Clinical Social Worker who is in private practice, Life Changes Counseling & Care Planning and Anneke Flannick, LCSW who is the Social Worker at Rush University Senior Care. AF: "I cannot stress enough how important and helpful it is for aging parents and adult children to have frank discussions about parents' wishes and plans for their healthcare and other aspects of their long term care as EARLY as possible. Ideally, these conversations are started when aging parents are healthy and very little action is actually necessary on the side of the adult children. What is needed simply is for the adult child to listen so they are well aware of their parent wants/needs, and are better able to support and advocate for them." KK: "The family should set aside a special time to talk - not on the regular Sunday call - but a special time - and set the stage with realistic expectations. Parents need to find out what's realistic for their children and what's not. Many adult children have the expectation that they will have to take sole responsibility for helping but if communications are open, a more realistic path for everyone can be found. Sometimes adult children end up doing things they are not good at, don't like to do or simply don't have the time to do. It's important to think about the match and the possibility of getting help from a broad array of sources." AF: "I encourage adult children to start where their parent is. 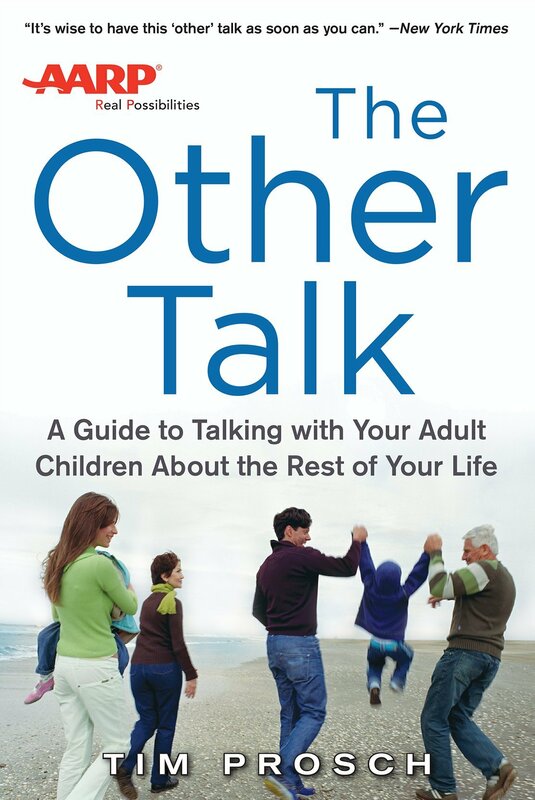 If your aging parent isn't quite ready to talk about certain topics, revisit it later and focus on what they are comfortable talking about. Your primary role is to listen and ask questions. For both the parent and the adult child, the most important aspect of these conversations is honesty. And while these conversations are often focused on preparing for the worst, they should also cover topics such as 'How often do you want me to check in with you? Do you ever want me to come to doctor's appointments?'" KK: "In order to have a productive conversation, it helps to move from the general to the specific. Start with a general question: 'How are things going?' Then move to the specific: 'I notice that doing the laundry seems harder for you. What do you think?" If a parent is not agreeing with the adult child, the child needs to respect that. It may be best to return to the conversation later or you can try, 'Is there anything that would make life easier for you?' And always, for parents and children, good communication is based on tone of voice, body language, presenting a warm, caring, demeanor - not accusatory or angry. This starts a two-way conversation and demonstrates willingness to listen and hear each other's point of view." Where do kids go wrong? AF: "Stepping in and making assumptions about their parents' wishes that aren't necessarily accurate. Even when an aging parent has made their wishes very clear to an adult child, that adult child may still try to push their own opinions and desires onto their parents. In being a true ally to their parents, it's so important to follow their parents' lead and be supportive, even if/when they may not agree with their decisions." KK: "The most common problem arises when an adult child observes changes and dictates what should happen. 'Mom, you need to ....' No one likes being told what to do, so this often sets the stage for resistance. A one-way conversation usually isn't productive." Where do parents go wrong? AF: " Assuming that their adult children know what they want in terms of medical or lifestyle decisions, or how and when they may want their support and assistance. This can be largely avoided if parents and their adult children have had honest discussions about these issues early on." KK: "Assuming only children or family will help and making children make the 'I'll never put you in a nursing home' promise. With good education and support many families can make a proactive plan for the future that closely honors parents' wishes and ideally avoids a nursing home. But we can never fully predict our needs or circumstances. When services and resources outside the family are not considered, caregiver burnout can happen. Most parents do not want that for their children but it happens a lot, often because the available resources aren't understood or an adult child believes they must 'do it all.'" AF: "The best way for an adult child to be a true ally to their aging parents is for them to be prepared! And that burden falls on both the aging parent and the adult child. The conversation needs to be initiated as early as possible so that everyone is prepared for when an adult child needs to take a more active role in assisting/supporting their aging parent." KK: "It is critical to find a path into that open, honest , two-way conversation that will help all family members to have realistic expectations and know what their role is to be, understand the community resources available and appreciate the fact that everyone must be flexible as things change in each other's lives. It can be helpful to shift the perspective from 'taking care of mom/dad/myself' as the primary goal to 'taking care of our relationship' as primary." The Village continuously seeks opportunities to surround members with resources that will both support and enrich their lives. On the Village website you will find specific resources that can support and facilitate adult children and their parents in becoming allies - including Plan Your LifeSpan and Aging and Its Financial Implications: Planning for Housing. Also on the website are examples of the thousands of service requests the Village has fulfilled for its members - many of which were to help adult children and their parent find their way on the journey to peace of mind. ... about always being there to help out. The Saturday of Labor Day weekend, office team member Carmen Salas took a call from member Lorraine Martin , who had lost her WiFi connection. Since it was a holiday weekend there were no volunteers available, Carmen didn't want Lorraine to have to spend the whole holiday weekend disconnected from the Internet. So on her way home she stopped by and not only fixed Lorraine's wifi, but also gave her instructions on what to do if it happens again. ...about counting on the Village. "I am so pleased (and relieved!) that the Village exists and gladly pay my dues, even though I personally don't use the services offered. It's needed and valued by so many - and it's one big insurance policy for me, for the future - a great resource for people of all ages." "Over the past five years, the Village has become an important part of my daily life. When I have had major problems, the Village has never failed to help me find solutions. And it has also provided me with friendships, opportunities to expand my mind and ways to be of service to others." We Believe in Ageless Innovators! Celebrate and learn from Chicago's "ageless innovators," people who continue to innovate after the age of 60 by focusing on risk-taking, launching new ventures and reinvention vs. retirement.